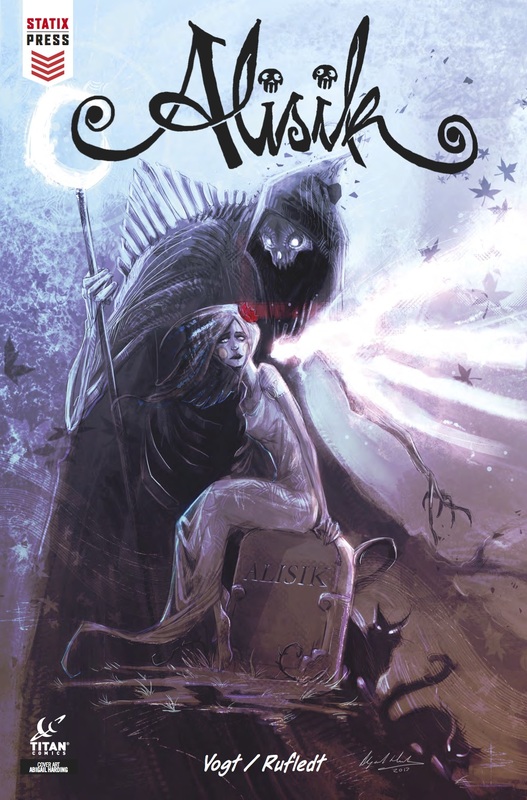 We were introduced to the series, Alisik, in February of 2018, published by Statix Press, a new imprint from Titan Comics. The series follows young Alisik as she wakes up one day in a cemetery, unbeknownst to her that she has recently passed away. On her journey to discover both her lost memories and what “life” will be like from now on, a dark, gothic tale is woven that is certain to be of interest to fans of supernatural horror and young adult fantasy alike. In volume one, we received a somber yet still fanciful introduction to the world of Alisik, as well as getting to know a bit about the various “post-mortems” that share the cemetery with her. 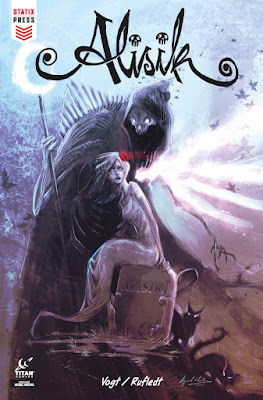 In a style that is definitely reminiscent of Tim Burton, the story that we began in volume one was dark, yet magical. We learn that each resident of the cemetery has yet to crossover to either the “world of light” or “realm of darkness” as their fate is currently being decided by the mysterious Mr. Grimm. Alisik is told that Mr. Grimm has to judge each of the recently deceased good deeds and bad deeds and this process could unfortunately take years, even centuries, leaving her in a battle, struggling to figure out where she fits in in this process. In volume two, the cemetery residents are shocked to learn that a young, very much living boy, Ruben, though blind, is able to hear and interact with the deceased residents. It is then that we realize that this is more than just a tale about a girl’s coming to terms with death and her journey to make it to the other side; it is also a story of forbidden romance. While in volume one, writer Hubertus Rufledt focused on the issue of mortality as well as Alisik’s initial denial and eventually her emotionally painful coming to terms with the fact that she is now no longer in the world of the living and her struggle with figuring out where she belongs somehow, volume two focuses much more on showcasing her personality and letting us get to know more about her as a character. Though a gothic tale that involves the mystery of the afterlife certainly is not a revolutionary idea, there is definitely a level of special beauty and charm in Rufledt’s writing. I spent much time pondering what I believed the targeted audience for this series to be, and I can’t quite put my finger on it. Though I think that it’s a story that one of many age groups can enjoy, I felt that fans of young adult fiction would probably be the most interested in this tale. While I can acknowledge that stories of death and heaven and hell can certainly be off-putting for a younger, more impressionable audience, the way this story has been written is one that I can really see resonating with a younger, more teenage audience. Though classified as horror/fantasy, Alisik is a story that deals with many things that I think the everyday teenager struggles with. Falling for a person that is in some way unavailable, the constant communication issues many teenagers face with those who have been in living in this world for longer than them, how to deal with feeling like you just don’t fit in in this world. I think there is definitely a stronger, underlying message that has been created within this story, which is one of the things that makes it especially memorable to me. I hope that Rufledt will continue to explore the parts of vibrant yet insecure young Alisik so relatable. Helge Vogt’s artistic style is so stunning; this series could be truly worth purchasing for the art alone. Also a bit reminiscent of the styles of Tim Burton in The Corpse Bride or Nightmare Before Christmas, Vogt turns a story about death, decay and the terrifying thought of mortality into a thing of ethereal beauty. Each character remains fanciful and vibrant, even in the throes of death, which allows the series to truly shine. I was not familiar with Vogt’s work before I picked up this series, but he certainly has made a fan in me. Where the art in volume one matched the very melancholy mood of the premise, the art in the second volume offers more vibrancy, life and scene diversity. Even the most decrepit of characters manage to still have charm and allure to them, and I really admire the work that has been put into this book. The level to detail within each panel is extraordinary, and many pages truly offer art that I can see many people wishing to frame and hang, which is not something you really get often outside of covers in comics. As someone who adores both fantasy and young adult themed stories, I was certainly engrossed in the continuation of Alisik. I look forward to learning more about each of the characters as well as continuing to read about Alisik’s journey to her eventual fate and watching her find out where she fits in to this new “life”. While I am thoroughly enjoying the mysticism and mystery enshrouding her death, I also have hopes to see where this tale will bring her romance with Ruben as well as continuing to explore the parts of her that, though deceased, are still incredibly human. Volume two is currently available for purchase and I will absolutely be waiting for volume three in anticipation.